Nature likes circles—things that spiral, rotate, circulate, orbit, and gyre. Circles have no beginning, no end, and circles don’t use up mass or energy, but conserve both, and that’s what nature likes about them. Take for instance the hydrologic cycle. There is no new water on Earth, nor will there ever be, only the same water evaporating from the ocean, falling again as precipitation, running off the land in rivers and other means, back into the ocean recirculating over and over again. There’s also the tidal cycle governed by monthly phases of the moon. Likewise, the atmosphere circulates and so does the ocean, endlessly round and round. These processes are highly complex; scientists devote their lives to understanding aspects of each, and the reason we know anything about air, atmosphere, and oceans is because scientists through the centuries, step by step, have sought to understand the planet we live on. But in less scientific, terms, we can say that circles in air and ocean connect each to the other to comprise a beautiful, even a poetic unity. We need not be scientists to appreciate the unity of nature once we learn from scientists that such unity exists and abides. Our subject being the ocean and its currents, let’s look back at the way they circulate in all the world’s oceans in order to return later to the Indian Ocean and the Agulhas Current. We touched on it earlier, but it’s worth repeating that all ocean currents are melded components of large basin-wide circulatory systems called gyres. In plain English, gyre refers to a circle in either form or motion. Those capitalized names (Gulf Stream, South Equatorial, Agulhas, etc,) are handy references for us; in nature, however, there are no separate currents with distinct origins and endings, but arcs of a unified circle. The technical name for the circles: Subtropical gyres. There is a subtropical gyre in the North and South Atlantic and Pacific and in the Indian Ocean. All gyres are propelled by the permanent wind belts of the world, the Trade Winds and the prevailing westerlies. The wind belts are caused by the sun and its uneven heating of Earth’s surface. The tropics are hot, the high latitudes cold in both hemispheres. This creates huge zones of low pressure (the tropics) and high pressure (mid-latitudes). In simple, but not entirely unscientific terms, nature seeks to redress the imbalance by sending wind from high-pressure zones toward low-pressure zones to fill the “holes” in the atmosphere. This goes on constantly, and that’s why the wind belts are permanent. Let’s use the North Atlantic Subtropical Gyre as an example to stand for the rest. It’s southern “boundary” lies near the tropics, and its northern boundary up at, very roughly, the latitude of Nova Scotia. 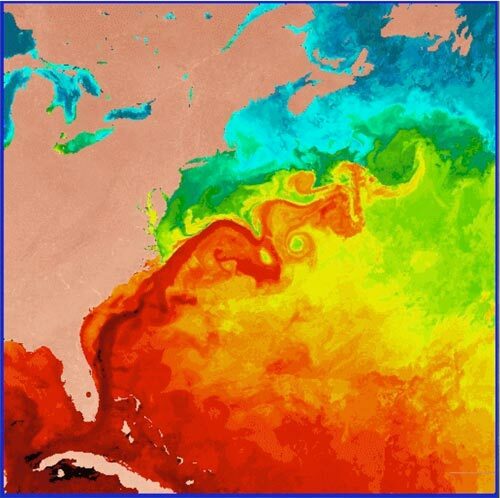 The Northeast Trade Winds blow along the bottom of the gyre from the eastern side of the ocean toward the west. The prevailing westerlies blow over the top of the gyre in the opposite direction. Centuries before anyone used ocean and science in the same sentence, sailors had concluded that wind, the same force that powered their ships, also powered currents. All successful explorers of the so-called Great Age of Discovery, Columbus and da Gama for instance, understood that they had to ride with the prevailing wind and currents, not attempt to fight them. We never heard of the ones who tried to fight both, because they died without getting anywhere. Wind blowing east to west along the bottom of the gyre, west to east over the top: See how the system therefore tends to spin in a clockwise direction? Then there’s the Coriolis effect we mentioned the other day. The force of the great globe’s rotation enhances the gyre’s clockwise spin. Combine the force of permanent winds acting on the ocean’s surface with the force of Earth’s rotation and you have a permanent system of currents wheeling around relatively still centers. The same thing happens in the Indian Ocean—but it happens in reverse. It’s a fact of physics and of geography that the Southern Hemisphere is a mirror image of the Northern Hemisphere. North of the equator the Trade Winds blow from the northeast. In the Southern Hemisphere they blow from the southeast over the top of the Indian Ocean Subtropical Gyre, while the west winds blow along the bottom. The Coriolis effect, which bends things like wind and current to the right in the Northern Hemisphere, does the opposite in the Southern Hemisphere. Therefore, the gyre in the Indian Ocean spins in a counterclockwise direction. However, the gyres share certain characteristics regardless of their hemispheric locations. The currents on their western boundaries (Gulf Stream and Agulhas, for two) are fast and narrow. 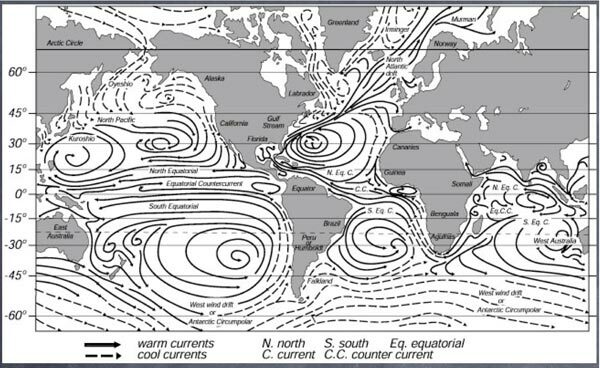 The Gulf Stream and the Agulhas flow in opposite directions, but both are western boundary currents. Both transport hot water from the tropics toward their respective poles. Deep, deep blue, they even look the same. The eastern sides of the gyres, in contrast, are characterized by broad, sluggish flow of cool water transported from the higher latitudes toward the equator. Mark Twain’s quip, “The coldest winter I ever spent was one summer in San Francisco” is apt because the city’s climate is determined in part by onshore wind blowing over the chilly California Current. But as a general rule, marine life on the east side of oceans tends to be richer than on the west side. This is because cold water tends to be richer than warm. But also because Earth’s rotation bends the currents such to promote upwelling of nutrients from deep water enhancing all levels of the food chain. Before leaving the gyre pattern of global circulation, we must point out there is one exception to the trend; one ocean is different from the others. It’s called the Southern Ocean. 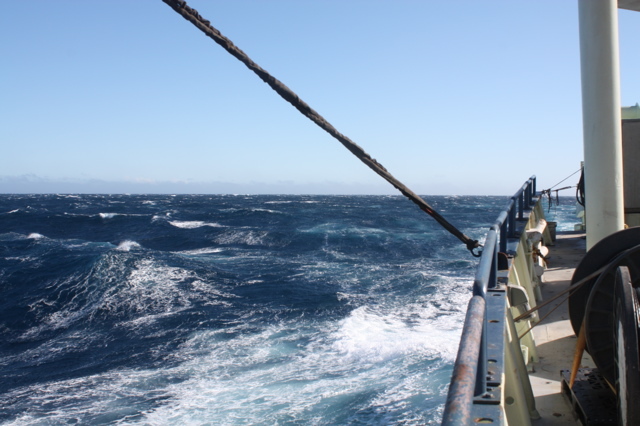 If you’re interested in nautical history you’ve probably encountered the term “Roaring Forties.” It refers to that region south of 40 degrees South latitude, beyond which there is little land, only the southern stalk of South America all the way around the world. The Southern Ocean surrounds Antarctica, and under its influence, savage winds whirl clockwise around the icy continent with no land to get in their way. 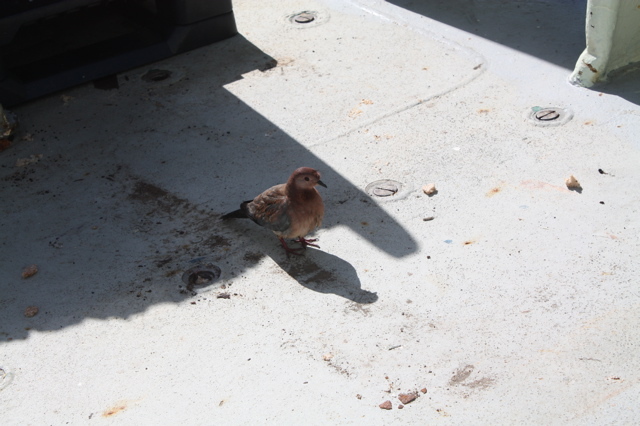 This old saying from the sailing-ship days nicely sums up the character of the Southern Ocean: “Below 40 South there is no law. Below 50 South there is no god.” Still, one might say that the Southern Ocean is also a great big gyre, since, after all, it goes round and round. And by the way, those legendary winds generate the largest current by volume of transport in the world, the Antarctic Circumpolar Current. Understanding the gyres offers a sort of broad-scale geography of the world oceans, a stable platform from which to learn finer-grained aspects of ocean behavior. It’s fascinating that all this dynamic activity goes on simply because the wind blows and Earth rotates. It would go on whether or not humans or any other life forms ever evolved. But because oceans circulate, distributing heat from where there is too much to where there is too little thus moderating many climates on a global scale and offering as a result rich ecosystems, they helped make our Earth a friendlier place for life, human and otherwise, to evolve and flourish.